I’m not typically someone who does a lot of baking, but the gorgeous bounty of fruit that the summer produces puts me under a mysterious spell and gets me in the mood. 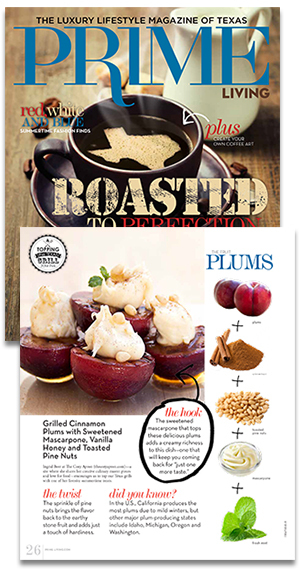 Fresh fruit is at its sweetest and most glorious now, and proudly calls out to be used in ways that will satisfy a sweet tooth specifically for from-scratch, freshly baked goodies. 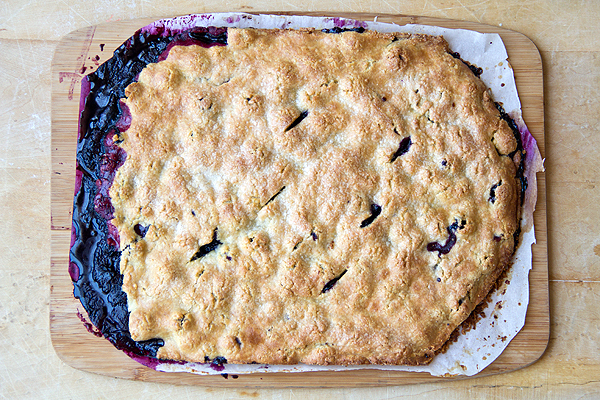 The colorful, juicy tartness of fresh berries lends itself perfectly to a sweet, flaky crust of a rustic sort, and the combination produces happy mouths and finger licking, summertime bliss. When I tried a recipe for blueberry-cornmeal pancakes a number of years back, I couldn’t get over just how sweetly nutty and rich in flavor they were, with an incredible, slightly gritty texture that was so unique and perfect with the fresh berries. 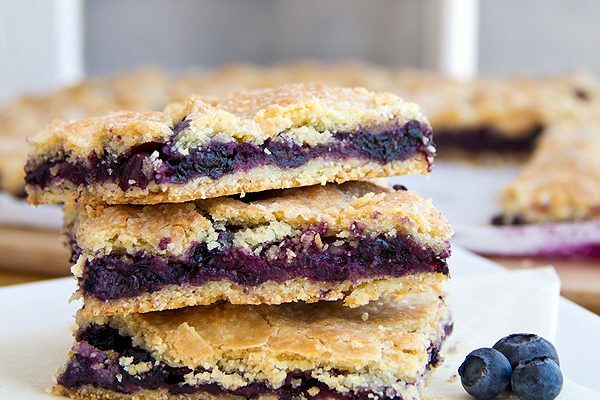 I fell in love with that combination; and when I was recently thinking about creating a summer dessert using blueberries, one of my favorite berries, I had an “ah-ha” moment: blueberry “pie” bars with a honey-cornmeal crust—kind of like a pie, kind of a bar. I’ll take two, please. Plump and juicy with toothsome “pop”, blueberries are the perfect little purple jewels to use in homemade, summer treats. 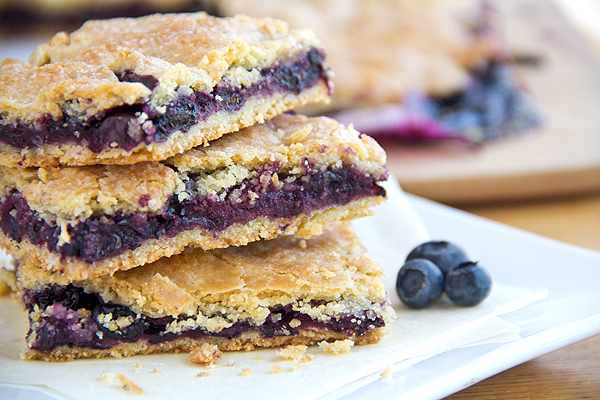 Paired with a hint of lemon and layered between two buttery, honey-cornmeal crusts, the flavor of these “pie” bars is the very epitome of summer—bright, floral and richly sweet. Oh yes, and a little corny, as well. -Into the bowl of a food processor, add the flour and all ingredients through the sugar, and pulse a few times to blend; with the processor off, next add in the butter, the sour cream and the honey, and begin to pulse for a few moments, then drizzle in the water and pulse a little more until the mixture begins to incorporate and resemble “crumble” (do not over-process the dough); next, turn the crumbly dough out onto a work surface, and using your hands, gently bring the crumbly dough together to form a ball, careful not to over work it too much; once the dough has come together into a ball, cut the dough ball into two equal halves, gently form each into a disc shape and wrap each disc in plastic wrap; chill in the fridge for about 30 minutes before rolling out. -While dough chills, prepare the blueberry filling (recipe below). -In a medium sized bowl, toss the blueberries gently with the remaining ingredients, and refrigerate until ready to use for filling. -Preheat the oven to 375 degrees, and line a standard baking sheet (at least 15.25”x10.25” or bigger) with parchment paper; allow the oven to come up to baking temperature completely before rolling out the dough to keep the dough from becoming warm while you wait. -Once the oven is heated, and the dough has chilled and the blueberry mixture has been prepared, prepare your work area to roll out your dough; sprinkle a little flour onto your work surface, place one of the dough “discs” onto the flour and roll out gently to about ¼” thickness, not too thick or too thin, trying as much as possible to maintain a rectangular shape (don’t worry if it’s more oval or round—this is a rustic, free-form assembly and preparation, and will not be perfect; also, if the dough is a bit crumbly or tears a little, just press it together to mend); once the dough is rolled out, wrap it gently around the rolling pin and unroll it onto the parchment lined baking sheet; next, add the blueberry filling over this, making sure to keep the filling as evenly spread over the dough as possible; next, repeat the process rolling out the second dough “disc”, keeping it as close as possible to size and shape of the first one; roll this dough gently around the rolling pin, and unroll it over top of the blueberries, creating the top crust; next, brush the half and half (or cream) over the top crust with a pastry brush, and sprinkle on the sugar; using a paring knife, cut about 6 small slits into the top crust to allow for the steam to escape while it bakes, and place into the oven to bake for about 40 minutes, or until the crust is a light golden brown; remove from the oven and allow to cool completely before cutting into bars, so that the natural juices from the blueberries have a chance to thicken up; cut into 16-20 bars and serve. These look so good and so gooey. I can’t wait to try these out for myself, love your photo’s as well, makes them look even more irresistible. hi! i don’t think i have cornmeal, is anything else i could use instead of cornmeal? maybe cornflour? or whole wheat flour? Thanks Valentina. As far as substituting something in place of the cornmeal, I won’t be able to vouch for it; this particular crust recipe is based specifically on the cornmeal. Made this today with 2 cups of blueberry and cinnamon. Super. 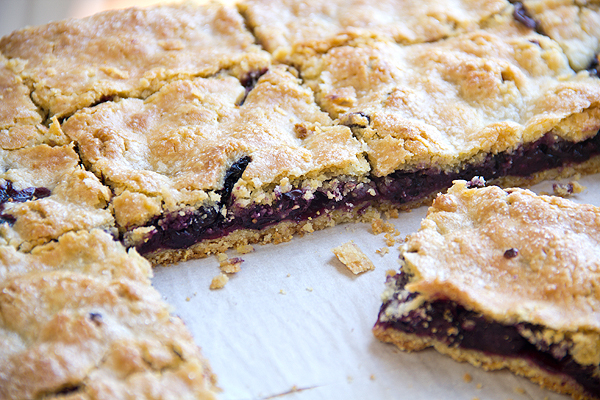 I like the thinner version of a blueberry pie… not so formal… easy to take one and walk around! Thank you for the wonderful recipe! 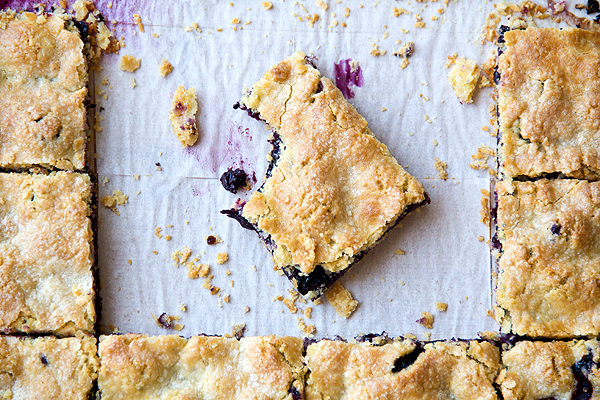 I made these blueberry bars last night (yes, in the middle of winter) using frozen blueberries and they turned out really great. I just put them in a colander on the counter for an hour or so. I really loved the cornmeal flavor with the blueberries, but would use fine cornmeal next time (the recipe doesn’t specify, but just personal preference) Also, I think I’ll add more lemon zest to the berries and perhaps to the crust mixture…..Overall, really tasty…. & blueberries are so good for you, all year long! Hi Sharon, thanks so much for your comment – and with good frozen blueberries, there’s no reason to not enjoy these treats in the middle of winter when we need something “bright” and juicy tasting!